Office 365 is a leading full-featured suite of office productivity and collaboration applications. It is designed by Microsoft to make work less tedious and for teamwork to be more streamlined. In line with that, Microsoft assures enterprise Office 365 subscribers that their software is always updated. As such, they have access to the latest tools and features for both the online and desktop versions of apps and services to make certain that their tasks are made seamless. Moreover, Office 365 is made available on all devices used by members of organizations to make them more productive regardless of where they are or even when they are on the go. 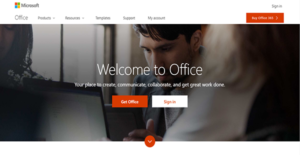 Users on Windows PCs and Macs, and Android and iOS devices can access Office 365 applications. This lets them become productive no matter what their preferred device is so they can work effortlessly on a familiar platform. Because of this, they are able to complete their tasks on time and ensure the continuous flow of work processes. Office 365 regularly provides business users with updates that offer enhanced and innovative tools. These allow an organization’s members to enhance further their performances on the desktop and online versions of the apps. With these, their security is also tightened, as Microsoft makes certain that their users’ data are safe from unauthorized access. With Office 365, company employees can save their work on their computers and in the cloud. This ability lets them collaborate with their teammates as well as with members of other departments for the prompt completion of the chain of responsibilities. Some versions of Office 365 come with Skype for Business, a polished version of the popular communications app from Microsoft for enterprise use. This makes audio and video calls go smoothly and include everyone who is expected to participate in a project. In addition, the office productivity suite can broadcast a conference to employees and stakeholders for them to simply observe the proceedings. With Office 365, subscribers can expect support whenever they need it, especially when they cannot find the answer on Microsoft’s extensive knowledgebase. That is because Microsoft enables business users to get in touch with the support team via chat, email, or phone for assistance with technical issues. On top of that, Microsoft also has a virtual agent that aids subscribers in finding answers to their questions in forums and manuals. If you are interested in Office 365 it could also be a good idea to examine other subcategories of Best Office Software gathered in our base of B2B software reviews. Since each enterprise has unique business wants, it is advisable for them to refrain from seeking a one-size-fits-all perfect software application. Needless to say, it would be useless to try to find such a system even among popular software solutions. The clever thing to do would be to jot down the various essential aspects that need consideration such as main features, finances, skill levels of employees, company size etc. Then, you should do your homework thoroughly. Read some Office 365 reviews and check out each of the other solutions in your shortlist in detail. Such comprehensive research can ensure you reject ill-fitting platforms and select the system that offers all the features you require for business success. Office 365 has seven enterprise pricing plans. Prices indicated below are monthly rates as well as annual commitments. Look at the packages to decide which is the best plan for your organization. We realize that when you make a decision to buy Office Software it’s important not only to see how experts evaluate it in their reviews, but also to find out if the real people and companies that buy it are actually satisfied with the product. That’s why we’ve created our behavior-based Customer Satisfaction Algorithm™ that gathers customer reviews, comments and Office 365 reviews across a wide range of social media sites. The data is then presented in an easy to digest form showing how many people had positive and negative experience with Office 365. With that information at hand you should be equipped to make an informed buying decision that you won’t regret. Easy for the whole system! What are Office 365 pricing details? What integrations are available for Office 365? Microsoft also enables you to connect your Office 365 apps with your custom enterprise application as well as with other software on-premises and on the cloud via the API. Easy integration of different programs and sharing ability between departments. If you need more information about Office 365 or you simply have a question let us know what you need and we’ll forward your request directly to the vendor.